1. The bystander is afraid of getting hurt himself. The bully is bigger and stronger and has a reputation that justifies the fears; so jumping into the melee doesn’t appear to be a smart thing to do. 2. The bystander is afraid of becoming a new target of the bully. Even if the bystander is able to intervene successfully, there is a chance she will be singled out at a later date for retribution. Bullies are quick to disparage and malign anyone who tries to intervene. 3. The bystander is afraid of doing something that will only make the situation worse. 4. The bystander does not know what to do. He hasn’t been taught ways to intervene, to report the bullying, or to help the target. Just as bullying is a learned behavior, so must young people be taught ways to stop it. It’s not my problem! This is not my fight! 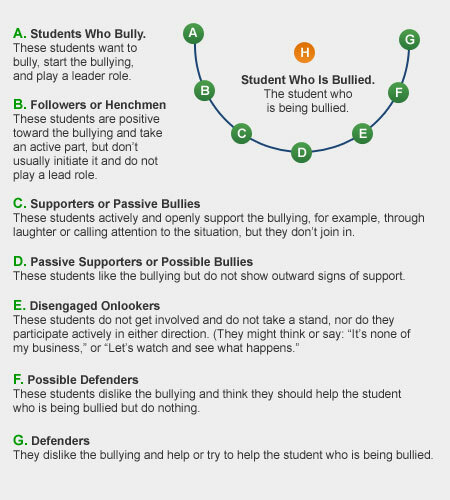 Everyone plays a role in the bullying cycle. Educating the “players” is an important first step in ending the gripping power of bullying. We often focus, to the exclusion of the others, on just the bully or victim. Educating and empowering the other participants, regardless of how passive their roles may be, is a crucial step towards addressing the issue of bullying.